The carnage against Gaza civilian protesters in shocking and unconscionable. Over 40 people have been killed just today and over a thousand wounded by live fire. Palestinians have a right to protest peacefully, and Israel has no right to shoot at protesters except in self defense. No Israeli soldier or civilian has been hurt or endangered. There is absolutely no excuse for this carnage. We cannot be silent in the face of this massacre. Our sorrow and pain at this human loss is tempered by our admiration for the protesters. We are awed and impressed by the determined nonviolence of these Palestinians. They go to their protests knowing that Israeli deadly drones and snipers are awaiting them, yet they go ahead to make their voices heard and their demands, which have been ignored for far too long known to the world. This is a reminder of Gandhi’s Salt March in India and the Sharpesville massacre in South Africa, and we have no doubt that their legitimate demands will eventually be realized. Brute military force cannot ultimately prevail against the determined spirit of a people prepared to die for their beliefs. Rights of the child, How can they be promoted and protected? We denounce in the strongest possible terms the use of deadly violence against unarmed protesters and call on Israel to refrain from such murderous behavior which constitute a crime against humanity. We also call for the immediate lifting of the illegal siege of Gaza and the permission of the flow of civilian goods and people in and out of Gaza. Non-violent protests and attempts to break this siege will continue and Nonviolence International is proud to support such actions. With this tragedy in mind, we are excited to introduce a new project into the Nonviolence International family. We Are Not Numbers, spearheaded by American journalist Pam Bailey, aims to humanize the victims of mass conflict through storytelling and mentoring. On their website, you can find dozens upon dozens of real-life accounts of the Palestinian struggle. From stories told by small children to octogenarians, We Are Not Numbers helps to provide faces to the statistics that are so widely spread. 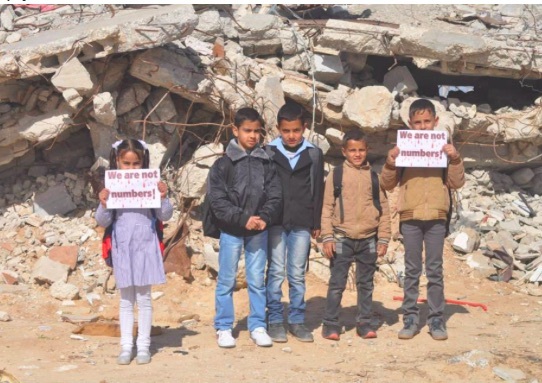 You can read their tales here: https://wearenotnumbers.org/home/Stories, and, as always, you can donate here: http://nonviolenceinternational.net/wp/donate/.